"The Vibe" room divider is a perfect option to create a new room, divide a large space, or replace an existing divider. With features like soft close, no bottom track, and a variety of modern panel inserts, this sliding room divider is great for any contemporary design. The ultimate in modern "The SoHo" room divider is here to stay. With frameless modern glass and a chic, elegant look, this is a great sliding room divider option for home or business. "The Manhattan" room divider is a smooth operator while maintaining that contemporary feel. The room divider can be complementary to "The Vibe" and "The SoHo" or be a beautiful door that accents any decor. The bottom rolling system keeps this door on track to be a hit! 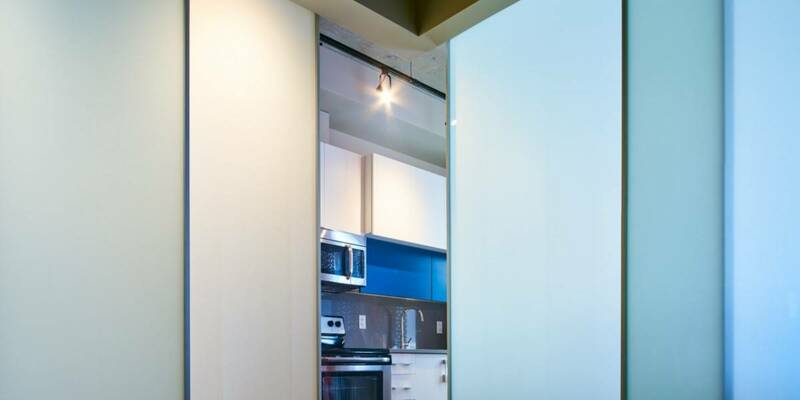 For more information on our room dividers, please contact Top Shelf Closets & Glass. If you are located in the Edmonton area you can also stop by our showroom. We are happy to find the best solution and provide specs to any builders or architects wanting to work our room dividers into their plans. Contact Top Shelf today if you have any questions and would like to review our three room divider options and the different styles available. Our design consultants are happy to help!